Foreclosures across the country have decreased over the years from 2.9 million in 2010 to 676,535 in 2017– a 76-percent decrease. However, foreclosures are still very real. Research from property database curator ATTOM Data Solutions indicated that foreclosures saw a 44-percent increase in July 2018, and California is not exempt. Foreclosures may happen but how you handle them can mean the difference between how smoothly the process goes or how much worse it can get. When you don’t know how the foreclosure planning process goes, you won’t know what to expect. So, it’s important to get to know what’s involved. Research and educate yourself on what’s involved by reading foreclosure-related content. It’s also important to contact an attorney or expert who is well-versed in foreclosure rules and laws in your state. Leaving bank notices unopened doesn’t make the foreclosure go away. When you ignore the issue at hand and make efforts to avoid the lender, the problem only festers. This can be one of the biggest mistakes you can make when you’re facing foreclosure because it can lead to detrimental consequences. Instead of dodging letters or ignoring calls from your lender, open up the notices and answer the calls. You may be able to renegotiate or restructure your terms if you show a willingness to work on resolving the issue. Bankruptcy is one option to get out of foreclosure since it stops the foreclosure process. But filing for bankruptcy is not your only option. You can look into government programs to help you get through the process or forgo foreclosure. You can also consider a short sale of your home if you get an offer from a qualified buyer before the bank schedules the foreclosure auction. You can also opt to sign over your deed to the bank by using a deed-in-lieu of foreclosure option. There are government relief programs to help you with these options, too, such as the Home Affordable Foreclosure Alternatives (HAFA). You can avoid foreclosure if you are unsure foreclosure is the right option for you by speaking to a financial advisor and a foreclosure attorney. Understanding the foreclosure rules in your state can help you have a clear understanding of what to expect. So, it’s important to research the rules and timelines of foreclosure. California law dictates that lenders have up to 90 days to send you a Notice of Default or NOD if you made no payment to your mortgage. Afterward, that notice is mailed to your home and has to be recorded in the county where the home is located, and the NOD will then begin as of that date. If you don’t make a payment in the 90 days following the NOD, the lender can file with the county’s recorder’s office and publish the foreclosure announcement in the newspaper for a Notice of Sale. The Notice of Sale must give at least 21 days before the trustee’s sale or foreclosure auction takes place. Damaging property intentionally that you know is not yours is a crime if there’s an order in place to prevent this from happening. In California, you can face fines, penalties and even jail time if you are convicted. Stealing light fixtures and other permanent elements of the property is illegal, too. This happened to a former San Diego police officer whose home fell into foreclosure. The police officer and his wife removed the air conditioner and ripped a tree from its roots and placed them in the pool. This amounted to approximately $160,000 in damages. The couple was found guilty and are facing four years in jail. So, when it comes to removing property or damaging the foreclosed home, don’t do it. If you let your property go into disrepair and stop taking care of it, you’re making a big mistake. The reason for this is that you could be held responsible for it, which only creates more financial issues for you to handle. It’s still not a good idea to let your home fall apart, especially in cases where you’re able to save your home from foreclosure. Forgoing legal counsel is a common mistake homeowners make when they’re facing a foreclosure, and it can cost them in time and money in the long run if they miss important deadlines or don’t understand legal terms. 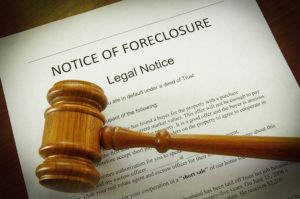 A lawyer can help you obtain a full understanding of the law as it pertains to foreclosures. A reputable attorney will make you aware of important timelines, and actions you need to take. They’ll also help you understand what your current situation is and all the available options you may have. Not seeking help during the foreclosure process can make going through the process more challenging. That’s why it’s important to have a reputable team of attorneys on your side who understand the process, such as the The Mellor Law Firm. The Mellor Law Firm offers experienced foreclosure defense attorneys with years of experience in foreclosure proceedings that you can count on while you go through the foreclosure process.